I’m Mr. Meeseeks! Look at me! Need help with a simple task? Caaan do! Need to take two strokes off your golf game? Look elsewhere. 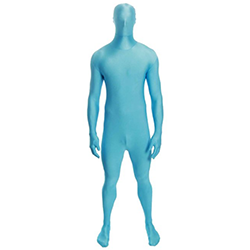 This color is a bit trickier to find, but the Morphsuits turquoise bodysuit matches perfectly. Put it on. 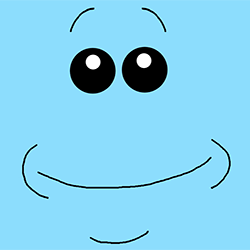 Become Mr. Meeseeks. Congratulations, you have now completed 90% of the costume. Just the head remains. If you are already in possession of an oversized bulbous head (or you are lazy and don’t want to craft a huge head), go grab a black marker to draw the face directly onto your body suit. Done. If, however, you want to go for the oversized head look, you’ll have to get a bit crafty. For starters, disregard the part of the bodysuit that covers the head. No need to wear that. From there, paper mache a balloon large enough to fit over your head, let it set, then cut off the bottom to fit your head through. Grab some turquoise spray paint to coat it, then carefully draw on the face, coordinating where you can cut out eye holes. That’s it! Go forth and perform simple mindless tasks joyfully.